Now that "Melisandre's Flames" socks are officially out for test knitting, I'm getting that "designing something new" itch big time. Why? Well, because I love to design, and because of Season 3, Episode 7 of HBO's fantastic original series "Game Of Thrones." What an awesome episode it was! And it was written by R. R. Martin himself. Love that! So, what kind of sock would the Hound wear? I'm thinking he'd be like Stannis. Something straight forward and sorta no non-sense stitch pattern. And something sharp, reminiscent of fangs. I think I've found the right stitch pattern, but, as usual, I think I'll modify it a bit. As for the colorway, I don't see him as a grey sock. I see murky colors of the forest because that is where he has been hiding. Plus, hounds are meant to hunt, and the forests are usually where the best game are. With this all in mind, I went stash diving and I think I've found the perfect sock yarn for the Hound. Originally I bought it at my local yarn shop thinking of Arya, but it wasn't ringing true for her, so I put it away. ETA: Since I started writing this post, I'm now wrestling with my sock yarn choice. The yarn appears to be a bit "stripy" and I just cannot see The Hound in stripes. So, I'm back to trying to find a colorway that rings true to my vision. Another problem. Do I have to use the colors of his House? Some GoT fans get really riled when House colors are not respected. 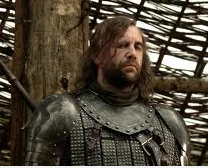 The Hound's House colors are gold and black. Grrrr. Maybe a nice charcoal? Hmmm. I also was struck by inspiration to do a Tyrell sock for Margaery. I can see it so easily in pink, or that pretty shade of blue she usually wears on the show. BUT, the Tyrell House colors are green and gold. Blah. Gold I could do, but green is way off for the very feminine design I have in mind. Oh well, we'll see. You make very creative knitting - I read with great interest! Thank you for commenting on my blog. I have not seen "Game of Thrones" yet because I don't have HBO, but I plan to rent the series over the summer.